Synthetic peptide within Human SERCA2 ATPase aa 1-100 (N terminal). The exact sequence is proprietary. HeLa cells and cell lysate, A673 cell lysate, HepG2 whole cell lysate (ab7900), Human kidney tissue, Human liver tissue. Our Abpromise guarantee covers the use of ab150435 in the following tested applications. WB 1/20000 - 1/100000. Predicted molecular weight: 115 kDa. IHC-P 1/50 - 1/100. Perform heat mediated antigen retrieval before commencing with IHC staining protocol. Flow Cyt 1/100 - 1/1000. This magnesium-dependent enzyme catalyzes the hydrolysis of ATP coupled with the translocation of calcium from the cytosol to the sarcoplasmic reticulum lumen. Isoform 2 is involved in the regulation of the contraction/relaxation cycle. Isoform 1 is widely expressed in smooth muscle and nonmuscle tissues such as in adult skin epidermis, with highest expression in liver, pancreas and lung, and intermediate expression in brain, kidney and placenta. Also expressed at lower levels in heart and skeletal muscle. Isoforms 2 and 3 are highly expressed in the heart and slow twitch skeletal muscle. Expression of isoform 3 is predominantly restricted to cardiomyocytes and in close proximity to the sarcolemma. Both isoforms are mildly expressed in lung, kidney, liver, pancreas and placenta. Expression of isoform 3 is amplified during monocytic differentiation and also observed in the fetal heart. Defects in ATP2A2 are a cause of acrokeratosis verruciformis (AKV) [MIM:101900]; also known as Hopf disease. AKV is a localized disorder of keratinization, which is inherited as an autosomal dominant trait. Its onset is early in life with multiple flat-topped, flesh-colored papules on the hands and feet, punctate keratoses on the palms and soles, with varying degrees of nail involvement. The histopathology shows a distinctive pattern of epidermal features with hyperkeratosis, hypergranulosis, and acanthosis together with papillomatosis. These changes are frequently associated with circumscribed elevations of the epidermis that are said to resemble church spires. There are no features of dyskeratosis or acantholysis, the typical findings in lesions of Darier disease. Defects in ATP2A2 are the cause of Darier disease (DD) [MIM:124200]; also known as Darier-White disease (DAR). DD is an autosomal dominantly inherited skin disorder characterized by loss of adhesion between epidermal cells (acantholysis) and abnormal keratinization. Patients with mild disease may have no more than a few scattered keratotic papules or subtle nail changes, whereas those with severe disease are handicapped by widespread malodorous keratotic plaques. In a few families, neuropsychiatric abnormalities such as mild mental retardation, schizophrenia, bipolar disorder and epilepsy have been reported. Stress, UV exposure, heat, sweat, friction, and oral contraception exacerbate disease symptoms. Prevalence has been estimated at 1 in 50000. Clinical variants of DD include hypertrophic, vesicobullous, hypopigmented, cornifying, zosteriform or linear, acute and comedonal subtypes. Comedonal Darier disease (CDD) is characterized by the coexistence of acne-like comedonal lesions with typical Darier hyperkeratotic papules on light-exposed areas. At histopathologic level, CDD differs from classic DD in the prominent follicular involvement and the presence of greatly elongated dermal villi. Belongs to the cation transport ATPase (P-type) (TC 3.A.3) family. Type IIA subfamily. Nitrated under oxidative stress. Nitration on the two tyrosine residues inhibits catalytic activity. Endoplasmic reticulum membrane. Sarcoplasmic reticulum membrane. 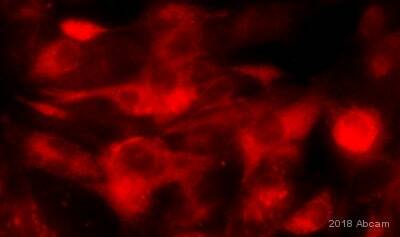 Immunofluorescence analysis of HeLa cells labelling SERCA2 ATPase with ab150435 at 1/100. Immunohistochemical analysis of paraffin embedded Human liver tissue labelling SERCA2 ATPase with ab150435 at 1/50. Overlay histogram showing HepG2 cells stained with ab150435 (red line). The cells were fixed with 80% methanol (5 min) and then permeabilized with 0.1% PBS-Tween for 20 min. The cells were then incubated in 1x PBS / 10% normal goat serum / 0.3M glycine to block non-specific protein-protein interactions followed by the antibody (ab150435, 1/1000 dilution) for 30 min at 22°C. The secondary antibody used was Alexa Fluor® 488 goat anti-rabbit IgG (H&L) (ab150077) at 1/2000 dilution for 30 min at 22°C. Isotype control antibody (black line) was rabbit IgG (monoclonal) (0.1μg/1x106 cells) used under the same conditions. Unlabelled sample (blue line) was also used as a control. Acquisition of >5,000 events were collected using a 20mW Argon ion laser (488nm) and 525/30 bandpass filter. This antibody gave a positive signal in HepG2 cells fixed with 4% paraformaldehyde (10 min)/permeabilized with 0.1% PBS-Tween for 20 min used under the same conditions. Immunohistochemical analysis of paraffin embedded Human kidney tissue labelling SERCA2 ATPase with ab150435 at 1/50. Publishing research using ab150435? Please let us know so that we can cite the reference in this datasheet.